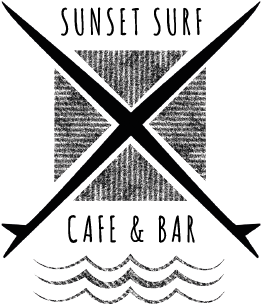 Sunset Surf Café is a family owned and run business, serving home-cooked, locally sourced food, Cornish coffees and drinks that go down perfectly out on the decking in the sunshine. We pride ourselves on the quality of our food, and on our efficient team and their service – and, of course, our absolutely stunning view. From Friday 5th April we will be open 7 days a week from 10am through to 4pm until after the October half term. Sitting above Gwithian beach, our café overlooks the golden dunes that lead down onto the huge expanse of sand below. When the sun is shining and we can hear the gentle noise of the sea, there’s no better place than on our terrace. Aside from the café and bar, we are also home to a beachside shop selling everything you need for a day on the beach. If lazing in the sun isn’t your thing, why not head downstairs and try your hand at a surfing lesson with the epic Rich Emerson? We are pleased to say that we welcome all well behaved dogs on leads. From October to April, dogs are allowed on the beach, and from May to September they can run amok on the sand after 7pm. Please use our contact form to get in touch, or use the contact details below. "Hot chocolate in the rain"
I love this place , great service which always seems to be able to accommodate the hordes who descend when the weather turns . Quality of food and drink is always good and service impeccable. 2017 SUNSET SURF. All Rights Reserved.